Feed your feline friend’s natural desire for meat with Wild Frontier Chicken & Turkey Recipe Variety Pack Grain-Free High-Protein Adult Pate Cat Food Trays. Made from protein-rich, animal-based ingredients—inspired by your cat’s ancestral eating habits. 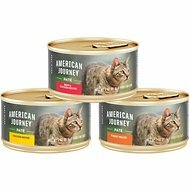 These cat food recipes are packaged in perfectly sized individual portions for no messy leftovers or refrigeration. They’re filled with nutrient-rich organs, such as liver for a high-quality protein that can support lean muscles and healthy play—for both outdoor and indoor cats. 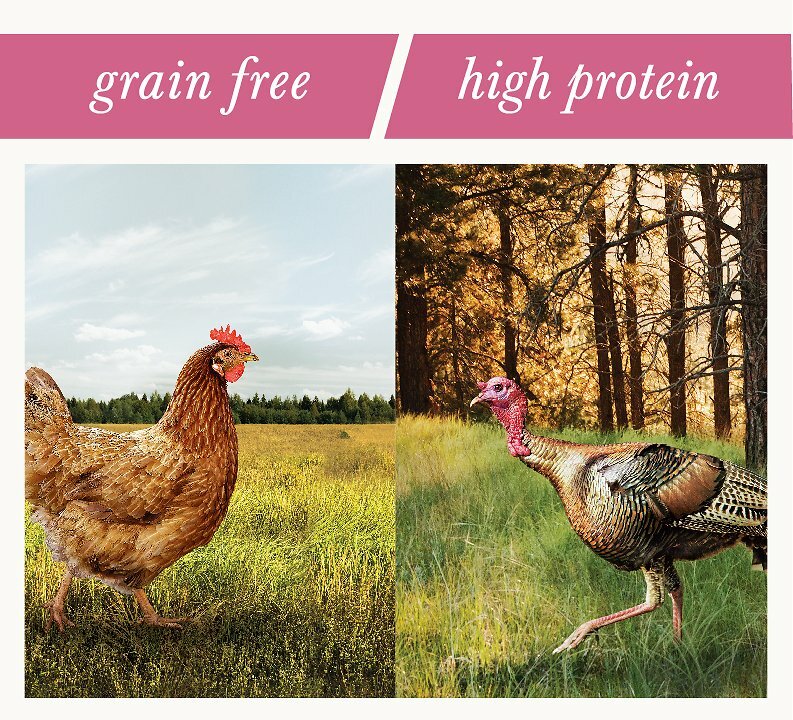 The complete and balanced grain-free formula is true to the hunt, with recipes that can give your cat the tastes he naturally desires. Real protein is the first ingredient, making this animal-based cat food one that supports your pal’s lean muscles and healthy play. Natural cat food that includes vitamins, minerals and other nutrients, yet doesn’t contain wheat, corn, soy or artificial flavors or preservatives. Variety-pack contains six twin-packs of Wild Frontier Perfect Portions Paté Chicken recipe and six twin-packs of Wild Frontier Perfect Portions Paté Turkey recipe. 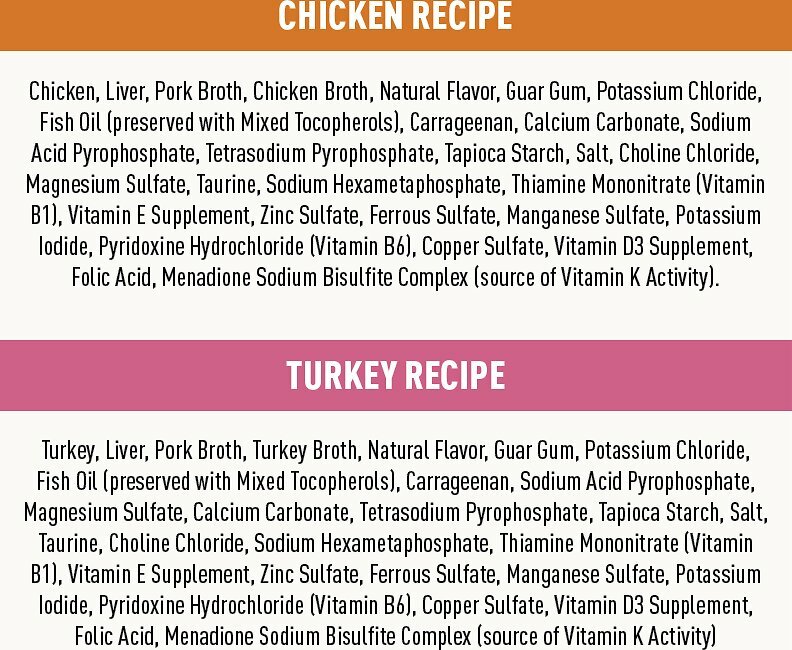 Chicken: Chicken, Liver, Pork Broth, Chicken Broth, Natural Flavor, Guar Gum, Potassium Chloride, Fish Oil (Preserved With Mixed Tocopherols), Carrageenan, Calcium Carbonate, Sodium Acid Pyrophosphate, Tetrasodium Pyrophosphate, Tapioca Starch, Salt, Choline Chloride, Magnesium Sulfate, Taurine, Sodium Hexametaphosphate, Thiamine Mononitrate (Vitamin B1), Vitamin E Supplement, Zinc Sulfate, Ferrous Sulfate, Manganese Sulfate, Potassium Iodide, Pyridoxine Hydrochloride (Vitamin B6), Copper Sulfate, Vitamin D3 Supplement, Folic Acid, Menadione Sodium Bisulfite Complex (Source Of Vitamin K Activity). 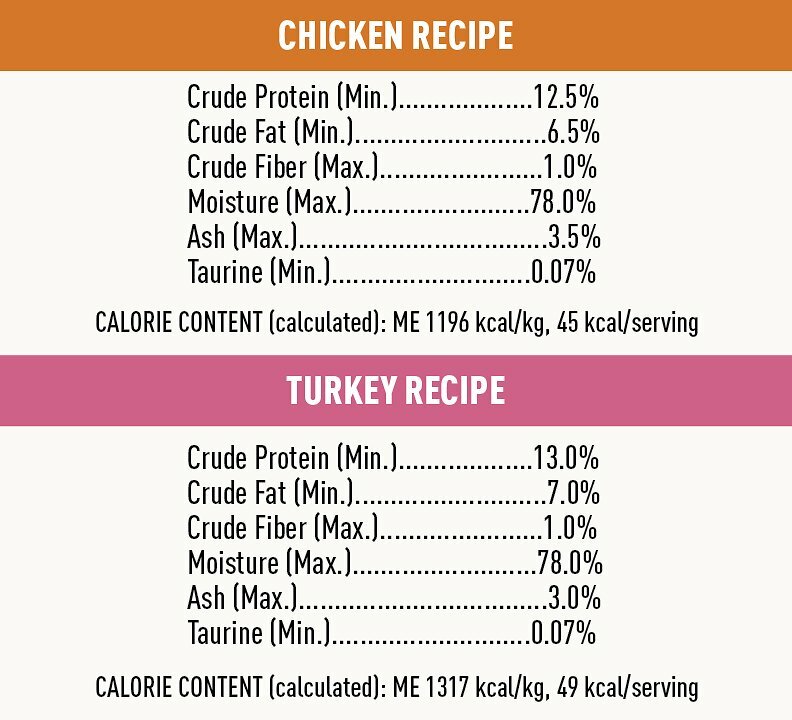 Turkey: Turkey, Liver, Pork Broth, Turkey Broth, Natural Flavor, Guar Gum, Potassium Chloride, Fish Oil (Preserved With Mixed Tocopherols), Carrageenan, Sodium Acid Pyrophosphate, Magnesium Sulfate, Calcium Carbonate, Tetrasodium Pyrophosphate, Tapioca Starch, Salt, Taurine, Choline Chloride, Sodium Hexametaphosphate, Thiamine Mononitrate (Vitamin B1), Vitamin E Supplement, Zinc Sulfate, Ferrous Sulfate, Manganese Sulfate, Potassium Iodide, Pyridoxine Hydrochloride (Vitamin B6), Copper Sulfate, Vitamin D3 Supplement, Folic Acid, Menadione Sodium Bisulfite Complex (Source Of Vitamin K Activity). 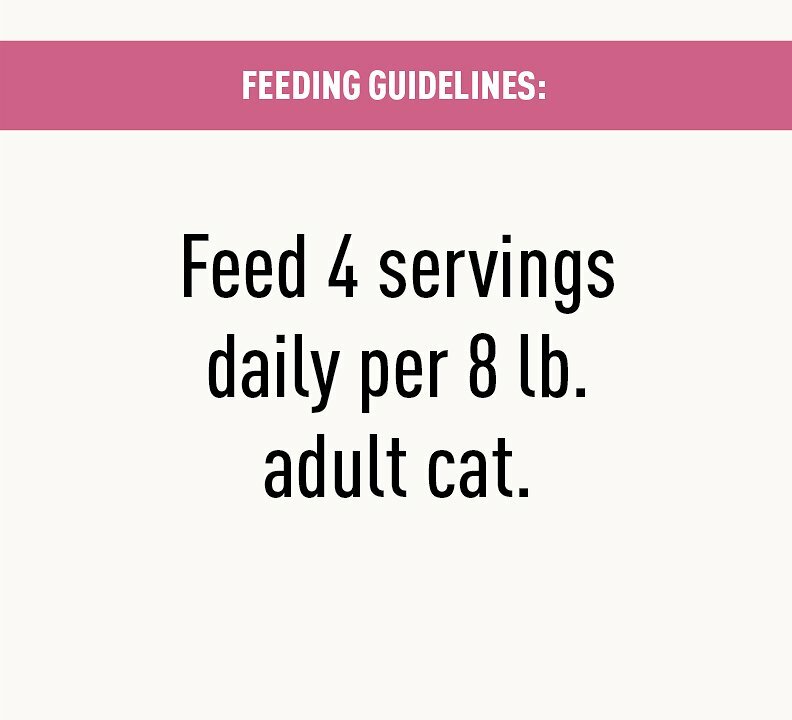 Feed 4 servings daily for every 8 pounds of adult cat's body weight. It's a bummer, she won't touch it, at all. I will take it to my daughter's cats. They eat anything. The only one she eats is the most expensive fancy feast trays in chicken with tuna. Or Sheba cuts in gravy turkey or chicken. I was hoping for a healthier food to have delivered by chewy. Oh well, so it goes with picky girl. Thanks chewy....she really loves her hot houses though. They were a hit for two winters so far. My picky 16 year old cat likes these, but I probably won’t buy them again. I feed her three times a day. These portion sizes are so small I have to giver her two at once or she’ll be too begging for more food before the next feeding. So really it was only twelve servings for us. Also, the packs are hard to open. I just about spill cat food juice all over every time I open one. That doesn’t happen with cans. I love tbe portion control. It corresponds exactly to one meal for him and he loves the taste. He is very picky so I am happy he loves this product. 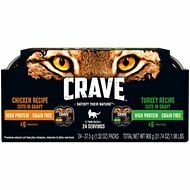 I will definitely purchase again, my cats loved this pate. I like the portion sizes and the peel open feature. No leftovers to refrigerate. I keep this on hand for when I'm not home and somebody else has to feed the kitties. Its portion controlled, very easy and not messy and good nutrition. My Emma loves this food. It is high protein and grain free....just what she needs. Our cat was throwing up her normal food which was regular Nutro Perfect Portions. Since switching to Wild she has been good.